Passengers travelling on the Wemyss Bay line could originally alight from the train at Ravenscraig Station which opened on 15 May 1865, the very first day of the new line. However it closed permanently on 1 February 1944 and locals are now served by Branchton Station which opened nearby in 1967. The station is 24¾ miles (40 km) west of Glasgow Central. Branchton Station consists of a single platform and (disused) building which is currently being upgraded.. 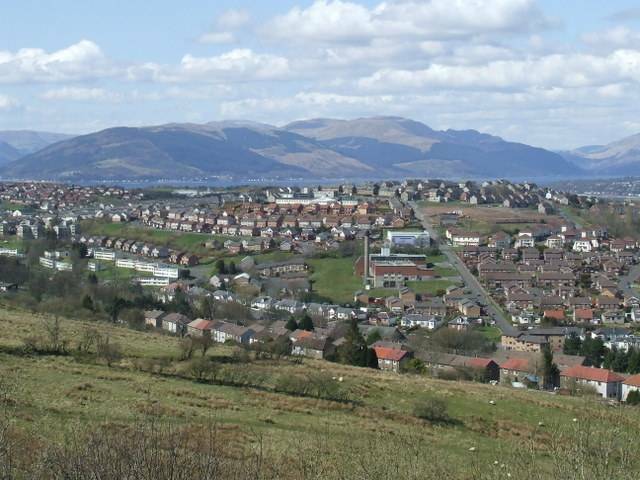 The view looks towards Port Glasgow. 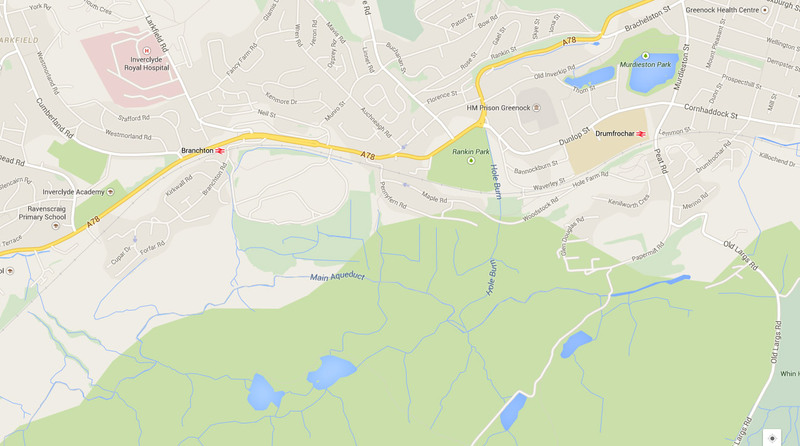 It is the nearest rail station to Inverclyde Royal Hospital which is about half a mile to the west. Tenements used to dominate the area, which acquired a reputation as socially disadvantaged, but a recent cash injection means that the area is being redeveloped with new housing and community projects. Ravenscraig Hospital is to the north of the housing, with its own access directly from the main road. HMCS Niobe (His Majesty’s Canadian Ship Niobe) was a shore establishment which occupied the site that latterly became Ravenscraig Psychiatric Hospital, Greenock, Inverclyde. Operating between 1941 and 1946, HMCS Niobe was the headquarters of the RCN (Royal Canadian Navy) in Britain and fulfilled a wide range of functions, including the provision of a hospital for wounded Canadian Servicemen, and a transit camp for RCN crewmen between postings in the UK. It also maintained listing of ship’s crew and next of kin for all RCN personnel based in the UK. 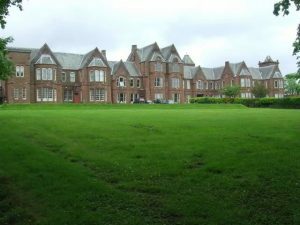 In 1947, the hospital was returned to civilian use, after a period of refurbishment, it reopened and became part of the NHS in 1948, when it was renamed Ravescraig. Numerous improvements were made, including the addition of an occupational therapy department in 1951. In the 1950s a day patients service was introduced, the first in Scotland. In the 1960s two new units for long–term patients were constructed. The hospital was transferred to the Board of Management for Greenock and District Hospitals in 1969. When the NHS was reorganised in 1974 responsibility for Ravenscraig passed to the Inverclyde District of the Argyll and Clyde Health Board. The original asylum buildings were closed in 2005 but peripheral buildings continue to provide psychiatric and geriatric services.